As weâ€™ve learned the last few weeks, God has a plan for Jacob. Jacob knows this, too, but heâ€™s still trying to do things his own way and for personal reasons. Jacob was the second son born of Isaac and Rebekah, and God had told Rebekah that the elder would serve the younger. Esau was born first and became Isaacâ€™s favorite. Jacob was Rebekahâ€™s favorite, but he was a deceiver and an opportunist. When Esau came home from hunting and was hungry, Jacob took advantage of Esauâ€™s bad judgment and sold Esau a bowl of stew in exchange for a bowl of stew. If these two brothers werenâ€™t fighting already, theyâ€™re fighting now. When Isaac approached death, Isaac wanted to lay his blessing on Esau, but his eyesight was so poor, Rebekah and Jacob believed they could trick Isaac. They concocted a plan to give that blessing to Jacob by dressing him up in Esauâ€™s clothes. They lied to Isaac. And when Esau found out, he vowed to kill Jacob. Their family is now in complete chaos. Rebekah sends her favorite son to live with her father to save his life, and thereâ€™s no indication she ever saw her son again. When Jacob arrives at Labanâ€™s house, he gets a taste of his own medicine. Jacob falls in love with Rachel and gives 7 years of work to Laban for her hand, but Laban tricks him, and Jacob marries Leah instead. Laban gives Rachel to Jacob also, but only in exchange for another 7 years of labor. The deceiver had been deceived. After 20 years of mutually destructive behavior, Laban and Jacob are no longer getting along, and Jacob flees. Again. God tells Jacob to go back home. Jacobâ€™s caught in a tough spot; Laban and his children hate him, but if he goes home, Esau wants to kill him. Jacob may have gained wealth from working his whole life, but his life is in shambles. Jacob acknowledges God is Abrahamâ€™s God and Isaacâ€™s God, but I donâ€™t see that he has acknowledged God is his own God. Jacobâ€™s progression of faith is such that he knows who God is and even recognized Godâ€™s sovereignty, but he has not truly placed his trust in the Lord. Well, maybe Esauâ€™s no longer mad at him; itâ€™s time to return home. Do you think 20 years away from home has eased the old wounds? Or do you think 20 years away from home has hardened Esauâ€™s heart and made him more bitter? Do you think putting off his conflict for 20 years has fulfilled or delayed Godâ€™s promises to Jacob? We pick up our story in Genesis 32 as Jacob begins his journey home. The angels of the Lord meet him. This must have been comforting to Jacob and it reminds him that the Lord had promised him back in Genesis 28 that the Lord was with him and would never leave him. Jacob was stressed out, not know what his reception would be like when he returned. 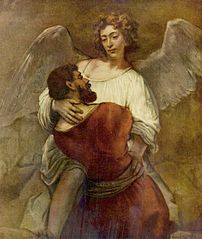 In the Old Testament, the appearance of angels offered great comfort but often appeared just before times of great trial, like the appearance to Lot just before Sodom and Gomorrah were destroyed. Jacob is about to undergo an ordeal where he has to face up to his own deceitful character. Jacob had put himself in this predicament because he had stolen the blessing from Esau instead of relying on God, and now heâ€™s going to have to face Esau and do things Godâ€™s way. Jacob sends messengers ahead of him to Esau in verse 3. I think Iâ€™d be afraid, too. Jacob is completely outmatched; Esau will have the anger and the manpower to crush Jacobâ€™s little donkey and goat army. Jacob starts laying out his plans; heâ€™s expecting Esau to attack, and Jacob makes plans for half of his party to escape should the other half be destroyed. Jacob has a decision to make. Doing the right thing means reconciliation with Esau. We all want to do the right thing, donâ€™t we? But doing the right thing is not easy. This is a crossroads that every believer must eventually face. What do I do, and how will I do it? When God calls me to do a most difficult thing, will I do what God wants? Or will I take the easy way, and do what I want? Unfortunately, sometimes we take the easy and selfish way. In this class, we are closer to our spouse than any other human being on the planet. We should examine ourselves daily to see how God wants us to treat our spouse, but weâ€™ve all discovered (and are still discovering) that being married comes with a few challenges. Will we do what God wants us to do? Or will we find some excuse? Itâ€™s too easy to say that we donâ€™t have to do the right thing because our spouse does this or our spouse doesnâ€™t do that. But God calls us to trust in Him. We face the same sort of decision Jacob faces. Will we do it Godâ€™s way, or will we do it our way? God has promised Jacob that the land of Canaan will be his. In order to claim this promise, Jacob is going to have to face Esau in an honorable way, in a way that is obedient to the Lordâ€™s will. But the last time Jacob saw Esau, Esau wanted to kill him. Loving God will require Jacob to love God more than he fears Esau. Doing the thing we resist most will gain peace with God. We must show God that we fear Him most in order to prove we love Him most. What holds us back from experience the completeness of Godâ€™s love for us? Is it fear, like Jacob experiences? Weâ€™re afraid to do something that God wants us to do? Is it anger that holds us back when God wants us to forgive? Is it something worldly God wants us to surrender but we want to keep it selfishly? In Jacobâ€™s case, he had selfishly destroyed his relationship with His brother, and God is calling him to repair it. Jacob had spent 20 years of his life, not wanting to face this moment. If Jacob was going to receive Godâ€™s promise, he was going to have to face the repercussions of his own actions. The prayer has many important elements of a prayer that God hears and responds to. He addresses God as God of his father and grandfather again, but heâ€™s added â€œO LORD,â€ Jehovah God, the proper name of the one true God. Jacobâ€™s God, Jacobâ€™s Lord. No longer is God merely the God of his fathers, but itâ€™s the â€œLord who said to me.â€ Itâ€™s Jacobâ€™s God. Heâ€™s approaching the Lord with humility; Jacob praises God for His kindness and faithfulness, and he knows he is unworthy of this favor. When we pray with a sense of pride or a sense that we deserve this favor, our prayers are ineffective. When we know that we cannot achieve anything on our own, that whatever ability we have in itself comes from God, then we realize how much we need God in our lives. God is so much bigger than us, but our own egos tend to inflate our sense of worth. We are important to God, we are very important â€“ but weâ€™re not worthy of the love and grace He gives to us. And Jacob is approaching God as an obedient servant; God told Jacob to return to Canaan, and as Jacob approaches God in prayer, Jacob tells God he trying to be obedient to Jehovah God. One of the keys to effective prayers is to come to the Lord with a sense of obedience. Jacob has a lot of guilt in his life, being deceitful with his father and brother. As Jacob prays, heâ€™s acknowledging that obedience to the Lord is important. And Jacob for the first time is his life seems to be praying for Godâ€™s will instead of his own. His prayer to God tells God that Jacob believes Godâ€™s promise that the children of Abraham and Isaac and Jacob will be fruitful and multiply, but Esau is coming to slaughter the mothers and the children. When we pray with Godâ€™s long-term plans as our primary motive, we are far more likely to pray for the right thing and to do the right thing. Now it is time for Jacob to fulfill his promise to the Lord that he made years earlier, back in Genesis 28:22 that Jacob will do the Lordâ€™s will and return to Canaan. But there is an obstacle. Itâ€™s Esau. The anger in Esau is a direct result of Jacobâ€™s bad behavior, of which Jacob must now repent. In Matthew 5:23-24, Jesus tells us that if we have a gift for the Lord our brother has something against us, we are to do 3 things in order â€“ 1) leave the gift at the alter, 2) go and be reconciled with your brother, 3, come back and offer the gift. Often times our path to the Lord requires us to travel right through the family member we have the most difficult relationship with. Jacob is learning the Lordâ€™s lesson that in his new spiritual growth and being obedient to the Lord, he is going to have to face Esau and his 400 warriors and reconcile with his brother. Even after praying to the Lord, I think Jacob is still scared. In verses 13-21, Jacob arranges for a series of gifts to be sent ahead of him. Hundreds of goats, hundreds of sheep, camels, cows (my cow), bulls, and donkeys. Each herd is sent separately in waves, and each servant is to tell Esau that they are gifts from Jacob. And Jacob spends the night in the camp before meeting Esau the next day. This is an interesting paradox. Because Jacob stole Esauâ€™s blessing, this blessing was now a curse. The blessing that was promised by God was now the very thing that might get Jacob killed. The only thing that Jacob has to offer Esau is the very thing he stole from Esau in the first place. No doubt praying to the Lord has given Jacob some wisdom on how to resolve the conflict with his brother. God gives us a brain and expects us to use it; just because we trust in the Lord doesnâ€™t mean we give up and wait for the Lord to fix things for us. We pray and we act together. Jacob is wrestling with â€œthe manâ€ and because of the word play in the original Hebew, itâ€™s unclear exactly who Jacob wrestled with. Was it really a man? Perhaps it was an angel, or perhaps Jacob wrestled with his own conscience. The phrasing is probably intentionally ambiguous so that we focus on the wrestling and not the person. Ultimately it is the Lord that Jacob wrestles with, and Jacob realizes this. Up until this night, Jacob thought his struggle his whole life was with Esau or Laban, but itâ€™s not. He realizes that his whole life, heâ€™s been wrestling with God. Jacob has made a spiritual journey that we all must travel. Often Christians will talk about â€œwrestling with God.â€ The struggle between our own will and Godâ€™s will is a daily battle. We want to do one thing; often God wants us to do something else. Some people struggle with addictions; others struggle with trying to keep their words and actions in harmony with what Christ wants from them. Sometimes God wants us to do something, but we donâ€™t. And we wrestle with God. Or another time God wants us to stop doing something. And we wrestle with God. Something that impressed me about Jacobâ€™s struggle is that God will let us win. If we are so set in being disobedient to God, God does not force us to be obedient. C.S. Lewis once said, “There are only two kinds of people in the end: those who say to God, ‘Thy will be done,’ and those to whom God says, in the end, ‘Thy will be done. '” If we are so determined to have our own way, God will let us have it. Non-christians who want nothing to do with God, who want to have no relationship, nothing, zero. God will let him have his way, to spend eternity without God in his life. David knew that praying to God to show him his own sin leads God to reveal his own offensive character to him, and that it would be painful and uncomfortable but would eventually lead to a closer relationship with God. So Jacob wrestles with God, and God does not overpower Jacob. God is so much more powerful, but yet God is gentle with us as we wrestle with Him. God with a mere touch cripples Jacob. We think we can wrestle with God and win, but we really canâ€™t. A mere touch from God is all it takes for God to win. God has control of the situation all along. When Jacob wrestled with God, what was he wrestling over? What choices did he have? Jacob is wrestling with the sin in his life by seeking to reconcile with his brother who he had defrauded when they were 20 years younger. This reconciliation is the right thing to do and Jacob knows it, but it places his life at risk. Esau wants to kill him. Will Jacob trust in himself and save his own life? Or will he risk his life doing Godâ€™s will? Jacob and God are wrestling over who gets to control Jacobâ€™s life. Once itâ€™s clear to Jacob that God is in control, Jacob finally submits to God. His life of disobedience has come to an end. This is what God longs for, for each and every one of us, for us to give up selfish control of our own lives and seek Godâ€™s will in our lives. Jacob finally submits and does not ever want to lose the presence of God in his life. Jacob says, â€œI will not let you go.â€ Jacob thought by fighting with God and doing it his own way would yield the best possible outcome, and instead ended up fleeing from his father-in-law and afraid of his brotherâ€™s wrath. Perhaps he thought if he could fight God and win, he could fight anybody and win. But only by submission to God does Jacob finally begin to see that true strength lies in submission. Jacobâ€™s plea to God to never leave him is rewarded two ways. One is by Godâ€™s changing his name from Jacob to Israel. Jacob means â€œhe grasps the heel;â€ Jacob was a heel, a deceiver. But now his name is Israel which means â€œstruggles with God.â€ Jacob will continue to have days where he struggles to do Godâ€™s will, but gone are the days Jacob takes pride in his deception. The second sign is his limp, a sign of Jacobâ€™s humility. Heâ€™s no longer the arrogant and prideful man, but a humble man whose strength comes not from himself but from his faith in God. Physically, he was weaker, but spiritually he was stronger. When we submit to God and seek Him, we walk out of darkness and into the light, just like Jacob. God says to Jacob, â€œLet me go, for it is daybreak.â€ This is an important event in the Old Testament, because in Exodus 33:20 God will tell Moses that no one may see Godâ€™s face and live. God protects Jacob by withdrawing from him before daybreak and not showing his full glory to Jacob, but even so, Jacob does not come away unscathed. His limp will forever remind him of his struggle with God and remind him where his strength comes from. Paul had a similar struggle with the Lord when he pleaded for the Lord to take away his thorn in his flesh, but God tells Paul that Godâ€™s strength is made perfect in weakness. Itâ€™s only by submission and asking for Godâ€™s will that we get out of His way and let Him accomplish what He was going to do, with or without us. When Jacob was in darkness, afraid and alone, he probably felt like God was very far away. How far away was God? When we wrestle with God, God is closer to us then than at any other times in our life. It feels like weâ€™re alone in the dark, but God is there with us. It feels like a great struggle we face all alone in the dark, but itâ€™s because we are not in submission to God that we feel we are alone. God is with us in our struggle. Once we turn from our rebellion and to Him for our strength, we walk out of the darkness and into the light and begin to see Godâ€™s blessings in our life. We, too, wrestle with God, and when we are submissive to his will, we see the day break. Jacob finally begins to receive Godâ€™s blessings in Genesis 33. Jacob must have confidence that the Lord was with him the next day, but still fearful that Esau wanted to kill him. But the Lord was at work on Esau; Genesis 33:4 says Esau ran to meet Jacob and embraced him, threw his arms around his neck and kissed him, and they wept together. God can do great miracles if we only submit to His will and let Him. Effective prayer depends on our obedience and humility and a focus on Godâ€™s greater plans. When we wrestle with God, we often feel alone and in the dark, but God is closer to us when we wrestle with him and submit than at any other time of our lives. And when we submit with humility, we walk out of that darkness and into the light. Wow! I am amazed at this. I have questioned this story and its meaning for about twenty years. This is an excellent article.